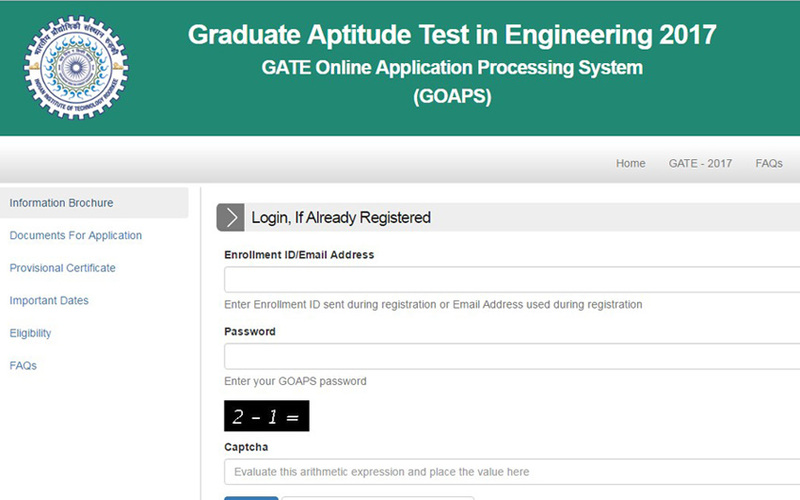 GATE 2017 Application, Roorkee, Sep 3: The Gate 2017 is organizing by the Indian Institute of Technology, Roorkee. The Institute releases the Important dates and opened the Online Registration. The Graduate Aptitude Test in Engineering 2017 will conduct in the month of February 2017. Here provided the Eligible criteria, Online registration process, and more details. The Gate 2017 online registration has started from September 1, 2016. And the Online Application will end on October 4, 2016 (Tuesday). Here you get: GATE 2017 Application Form Online & Exam Dates, GATE 2017 Exam Date & Important Details, GATE 2017 Eligibility, and How to Apply for GATE 2017. The Graduate Aptitude Test in Engineering is the way to join in the master degree and doctoral in India. The IITs conducting GATE exams for each and every year. For this year, the IIT Roorkee organizing the GATE 2017 exam. The GATE score is not only to join into the IITs and other leading colleges. It also needs to join Public and Private sectors jobs. There are totally eight zonal centers in India. All the institutions are conducting this GATE 2017 exam jointly. Maximum of you already heard all the eight zonal centers. If not, then here is the list of eight IITs such as IIT Bangalore, IIT Bombay, IIT Delhi, IIT Guwahati, IIT Kanpur, IIT Kharagpur, IIT Madras and IIT Roorkee. As like the GATE 2016, the organizer will conduct this GATE 2017 for International Candidates. The 2017 GATE exams shall be held in Bangladesh, Ethiopia, Nepal, Singapore, Sri Lanka and United Arab Emirates (U.A.E). The Admit Card will be declared on 5th January 2017. The GATE 2017 result will be announced on the date of 27th March 2017 (Monday). According to the report of GATE 2017 Press Release. Here we provided the Eligible criteria to apply for online GATE 2017 Application form. Five-year integrated Master’s degree or Dual Degree in Engineering/Technology and those in the fourth or higher year of such programs. If you registered already on GOAPS, then enter your login ID and password. OR, click the “New User? Register Here” option at the last of the login page. The Registration Page will be opened, now enter all the fields given. Then enter the Captcha to verify as you are the human being. And Upload your scanned copies of Photograph and signature if necessary. Share this “Gate 2017 exam date, Gate 2017 application form online registration, Gate 2017 syllabus, Gate 2017 eligibility” with your Friends those who all need to write online GATE 2017 exam.